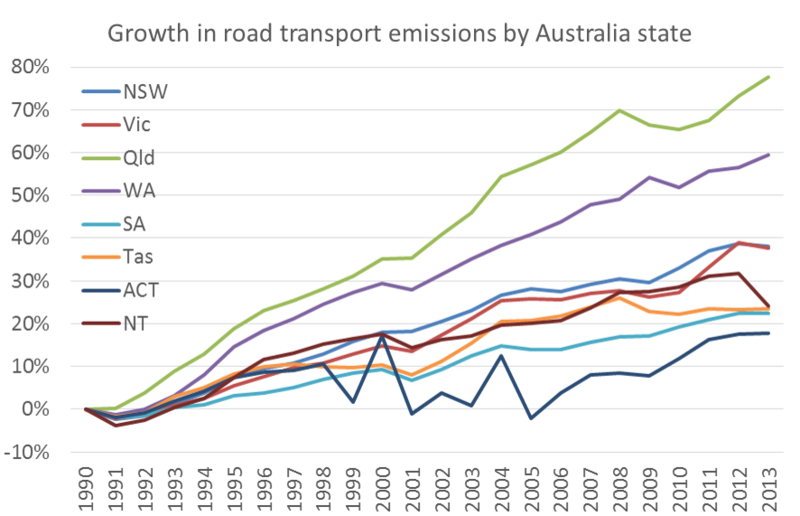 Are greenhouse gas emissions from transport still on the rise in Australia? 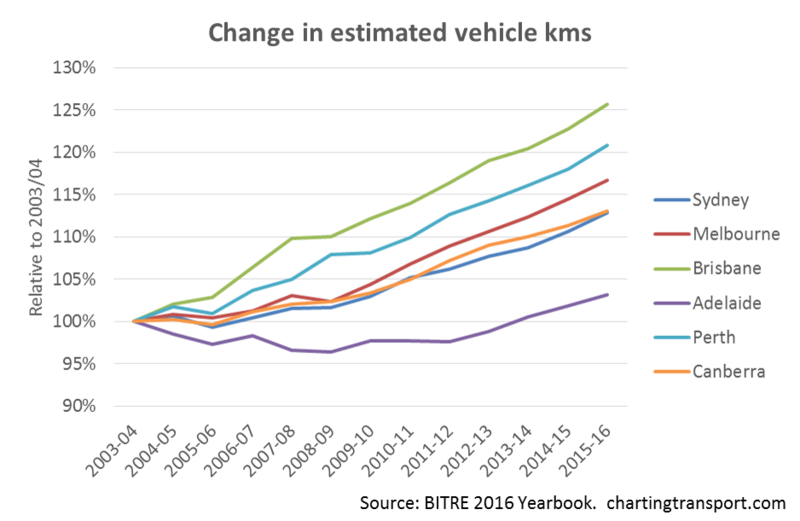 Are vehicle fuel efficiency improvements making a difference? 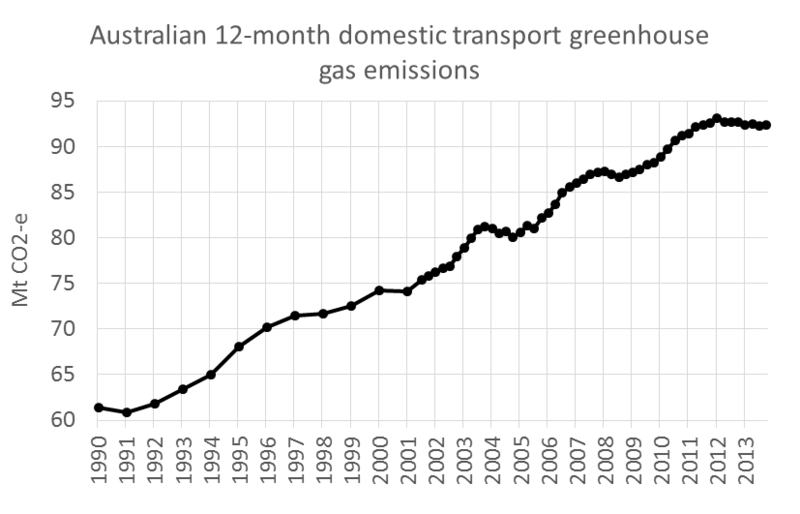 This post takes a look at available emissions data. 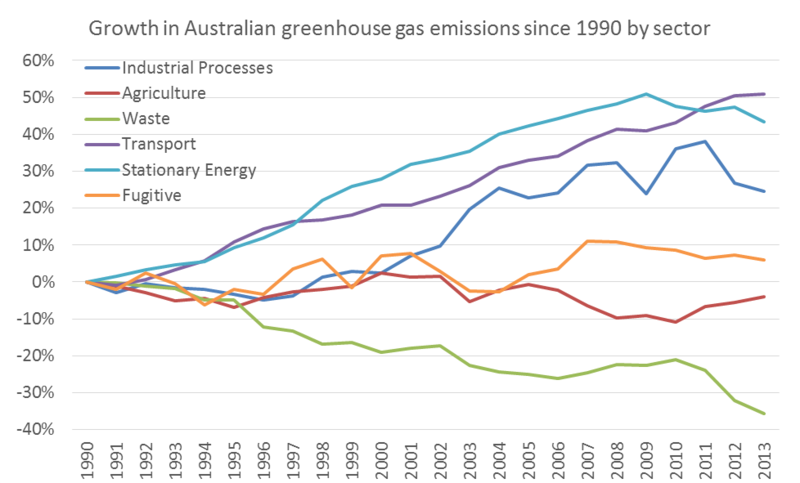 The Department of Environment’s National Greenhouse Gas Inventory reports Australia’s emissions in great detail, and 1990 to 2013 data was available at the time of updating this post (there is usually more than a year’s lag before this data is released). 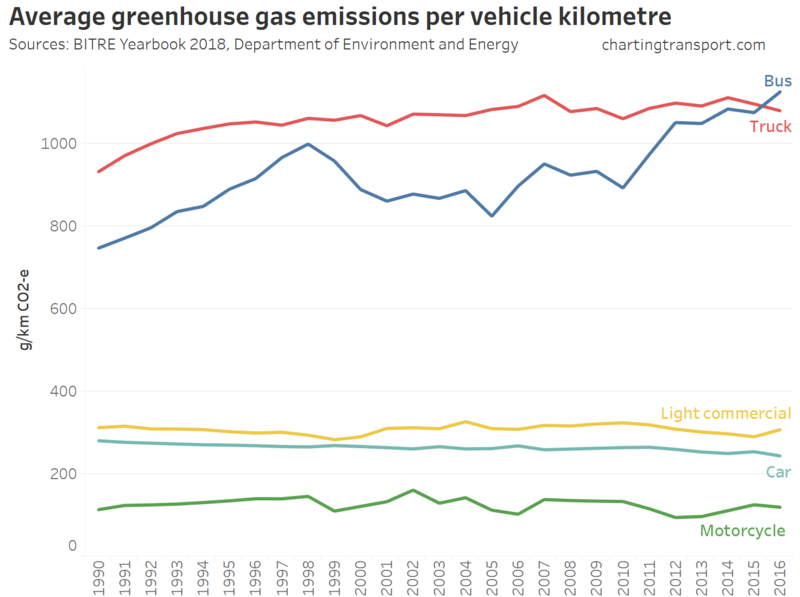 Emissions have grown by 50% since 1990, although a peak was experienced in the 12 months to December 2012 with a slight decline since then. 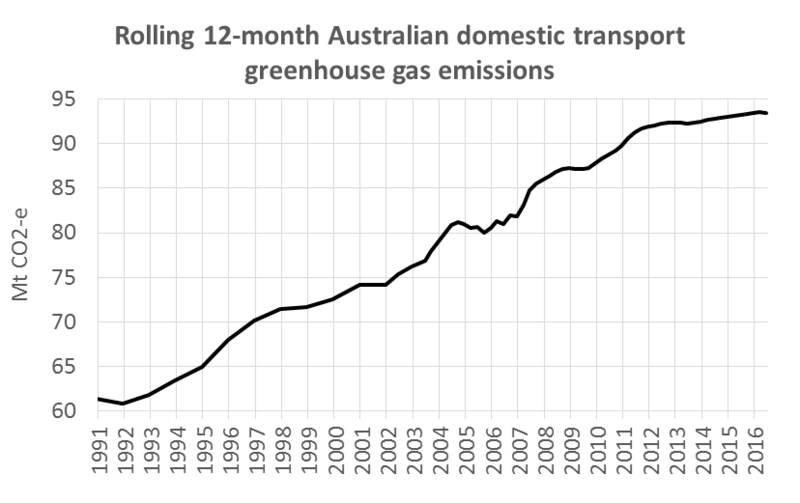 Transport was responsible for 17.2% of total Australian emissions in the year to September 2014 (excluding land use), an increase from around 15% in 2002. 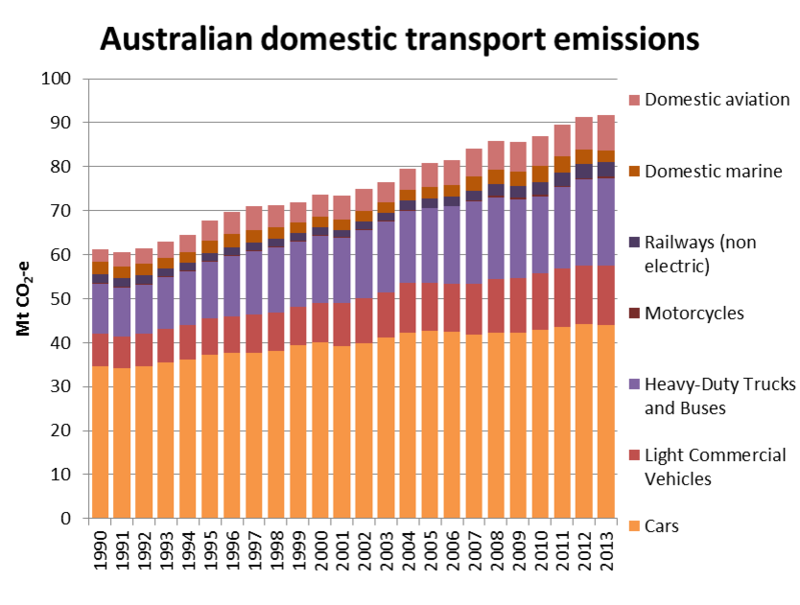 Road transport contributed 84% of transport emissions in 2013 (down slightly from a peak of 89% in 2004). 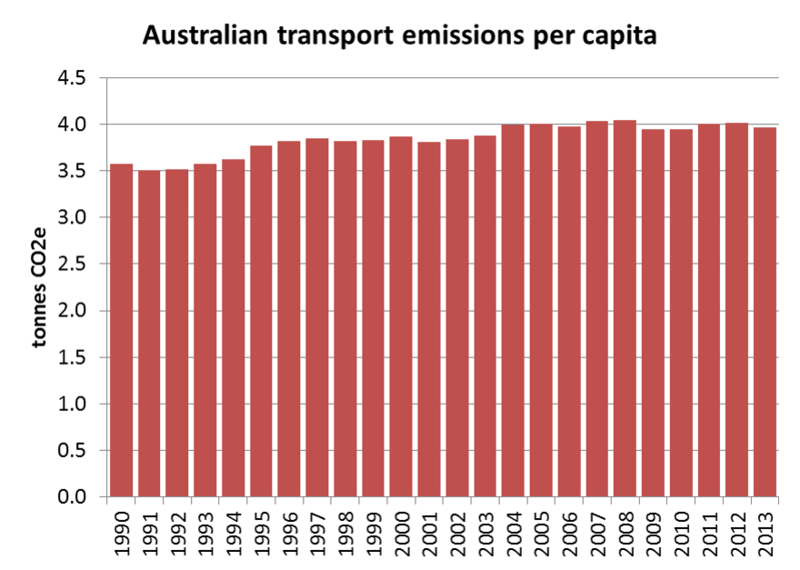 Cars accounted for 48% of Australia’s transport emissions in 2013, down from 57% in 1990. 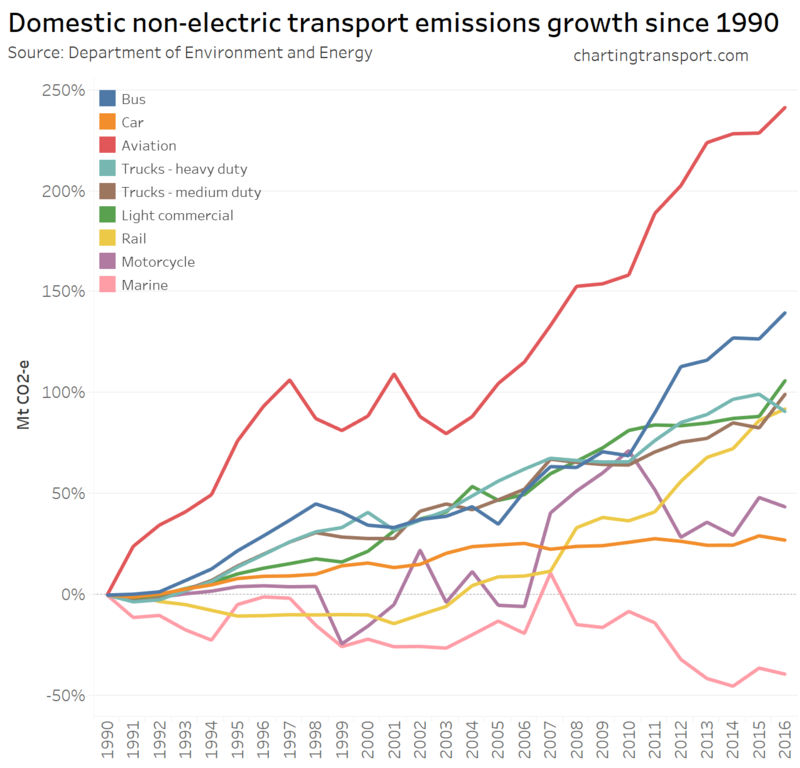 Note that the above chart does not include electric rail emissions (see below), indirect emissions, or emissions from international shipping and aviation. 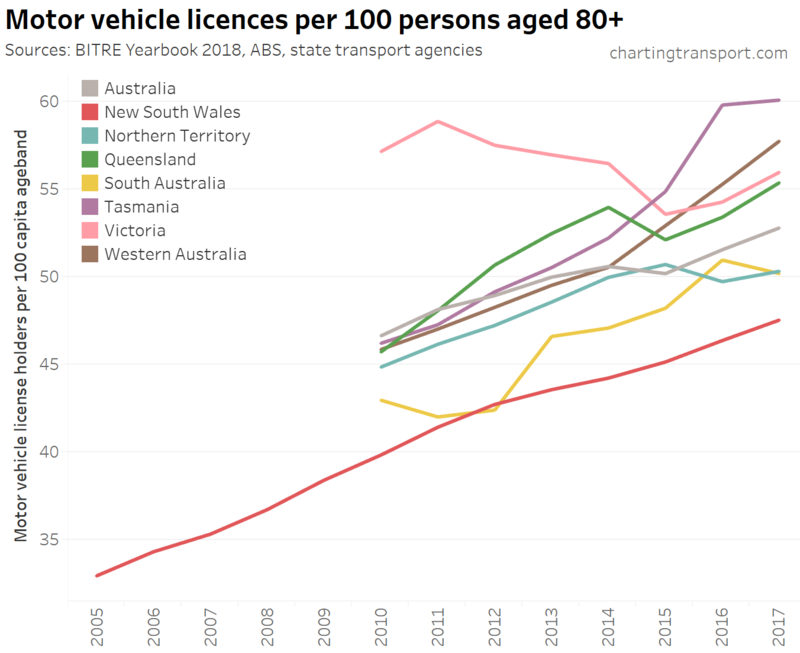 Estimates for these are included in the following chart lifted from an 2008 ATRF paper by BITRE’s David Cosgrove. It shows this components add a lot on top (and the future projections are frightfully unsustainable). 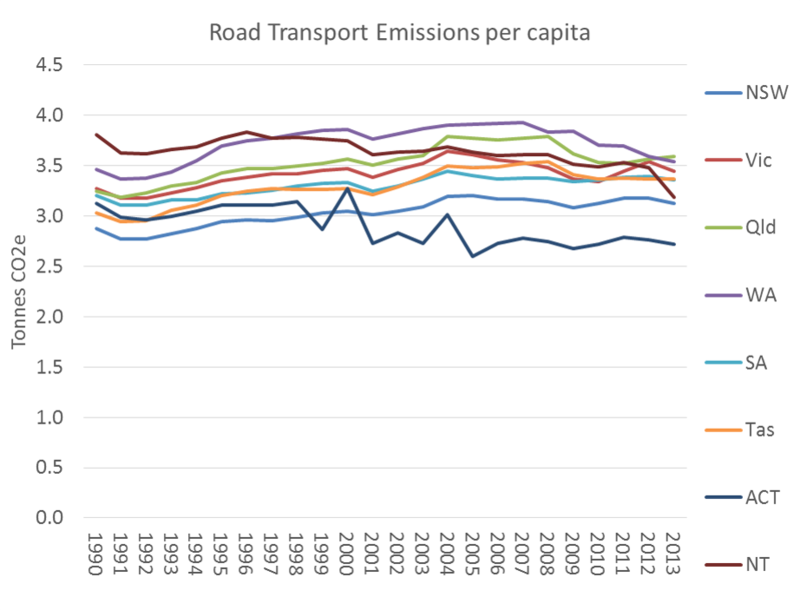 International transport emissions seem to sneak under the radar in the published figures. 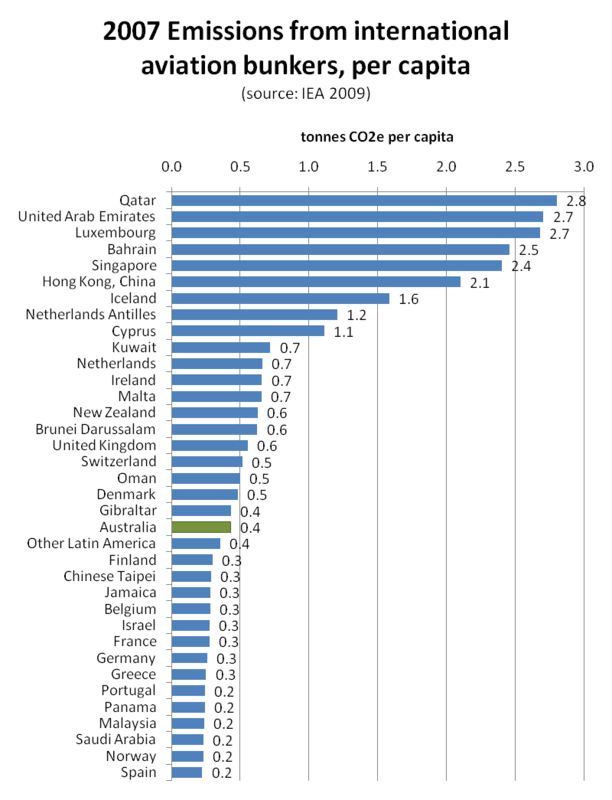 To put that in context, 4 tonnes per capita is just above Romania or Mexico’s total greenhouse gas emissions per capita (from all sectors, not just transport). Electric rail emissions are included under stationary energy, rather than “transport” in the main inventory. 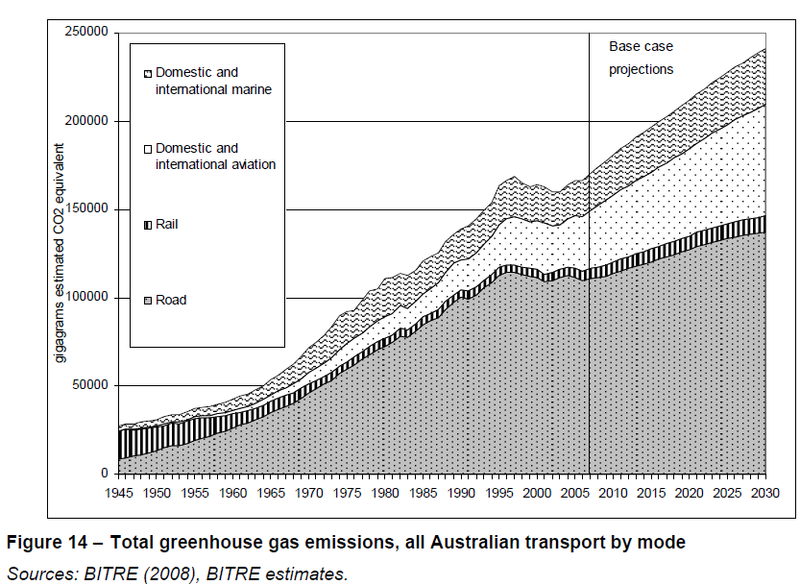 Melbourne train and tram electricity emissions have been estimated at 505 Gg for 2007 (ref page 8). 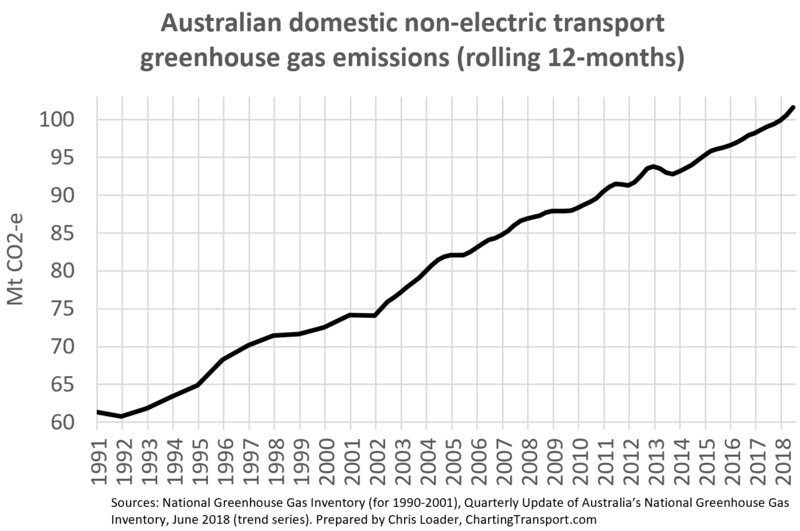 Apelbaum 2006 estimated that Australia electric rail emissions in 2004/05 were 2,082 Gg (ref page 68), which is very similar to the inventory figures. 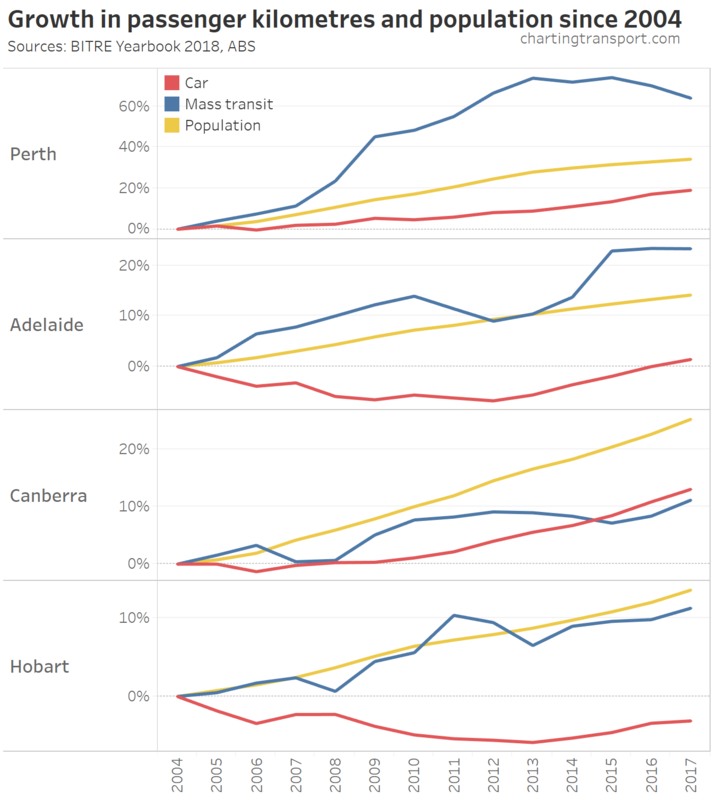 I’ve struggled to find any other figures on electric rail emissions in the public domain. 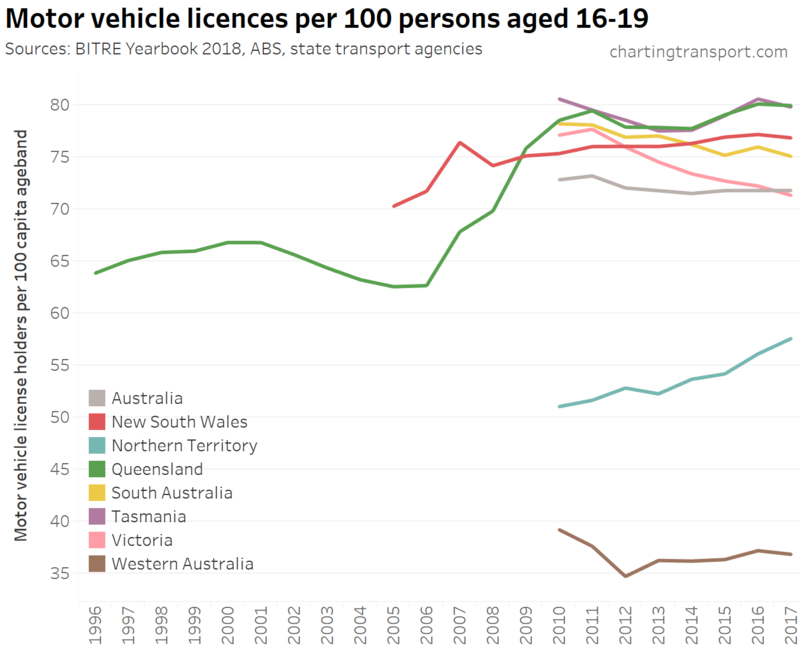 Within the transport sector, civil aviation has had by far the strongest growth since 1990 (but note this comes off a low 1990 base as airlines were recovering from the 1989 pilot’s strike). There’s been a lot of growth in light commercial vehicles, trucks and buses, and in more recent times, railways. 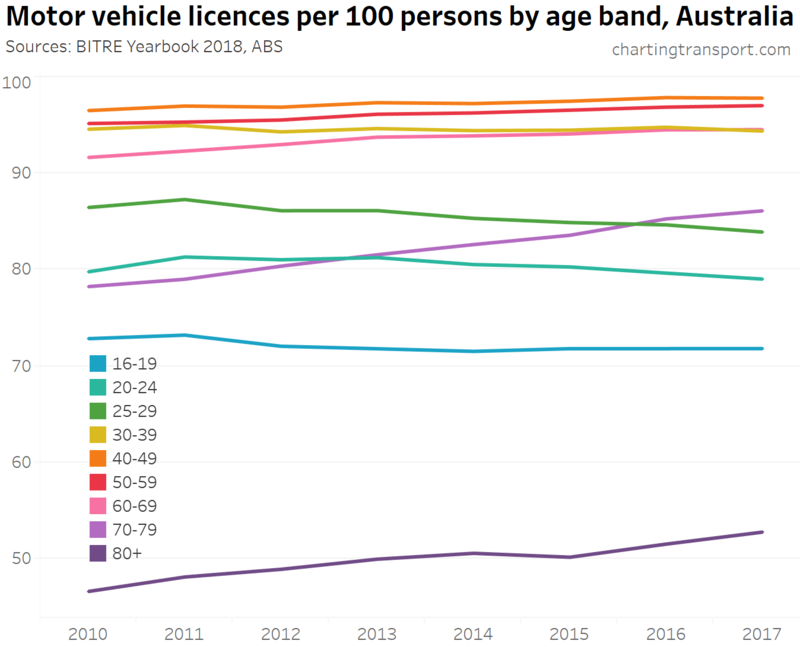 Emissions from cars are continuing to grow, while domestic marine and motorcycle emissions have fallen (there appears to be a lot of fluctuation in the motorcycle estimates so I’m not sure I’d read too much into the movements). 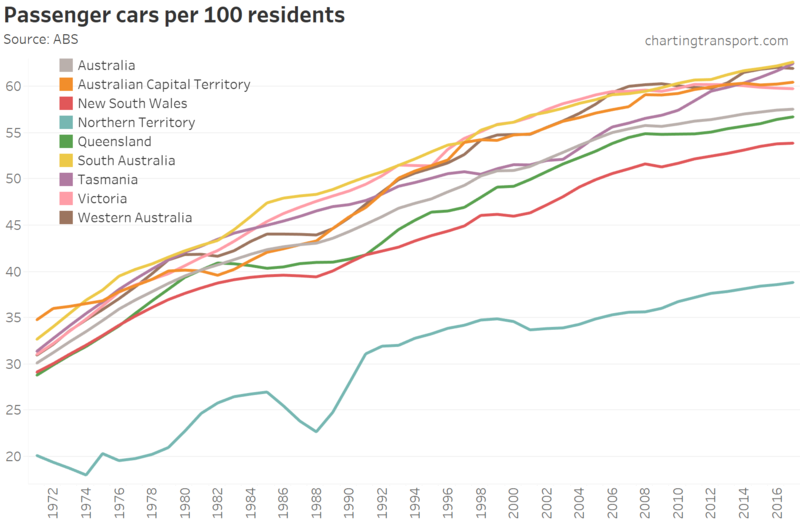 Queensland and WA have grown the fastest by far, followed by New South Wales and Victoria. 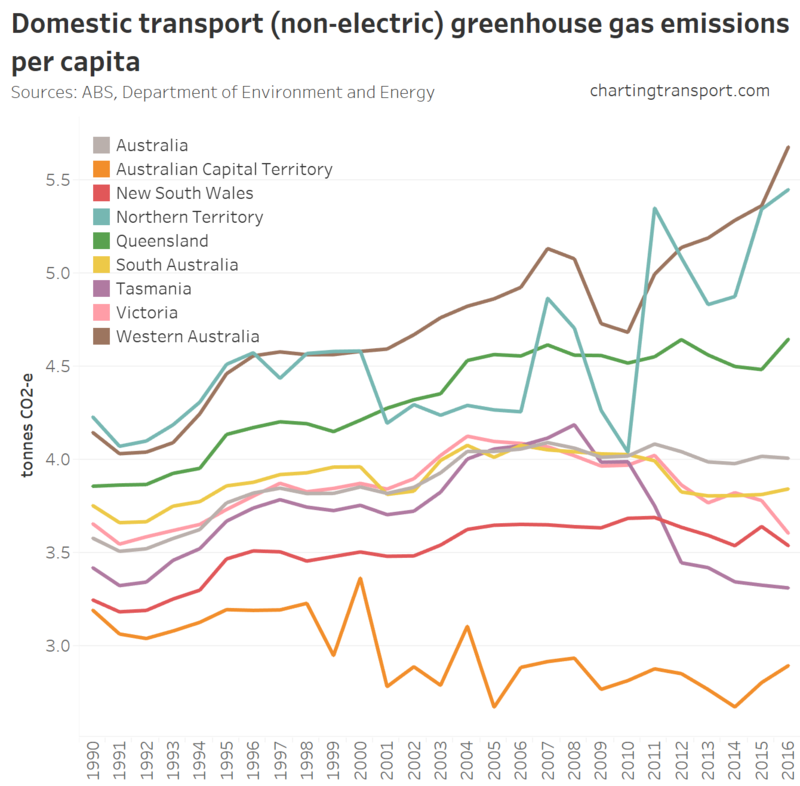 The following charts remove the impact of population growth on trends by showing emissions per capita figures for each state. 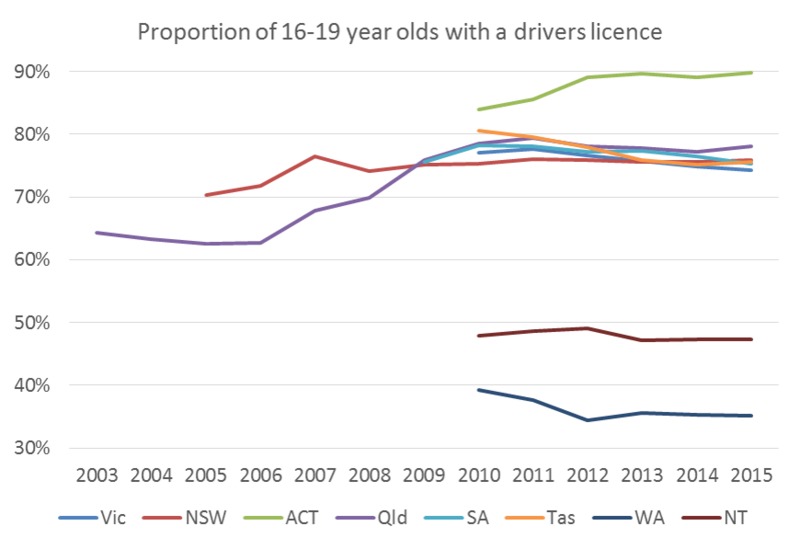 Some states appear to be declining while others appear relatively static. 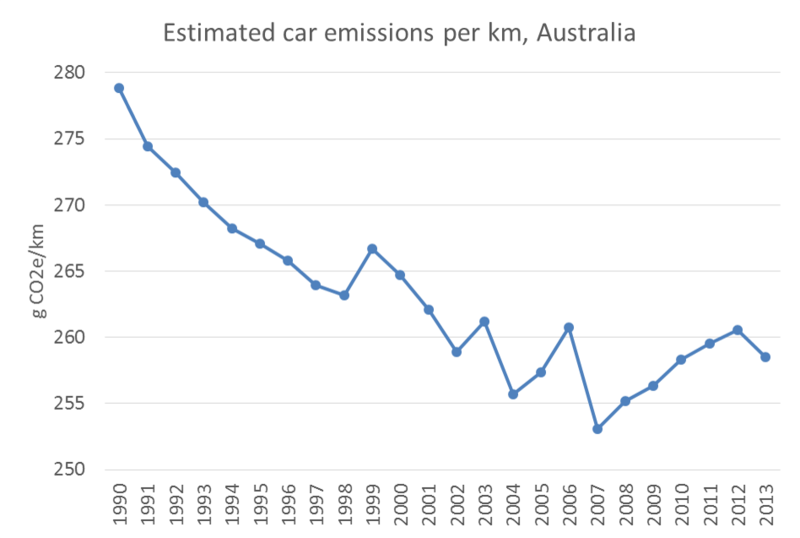 Car emissions reductions – mode shift or fuel efficiency? 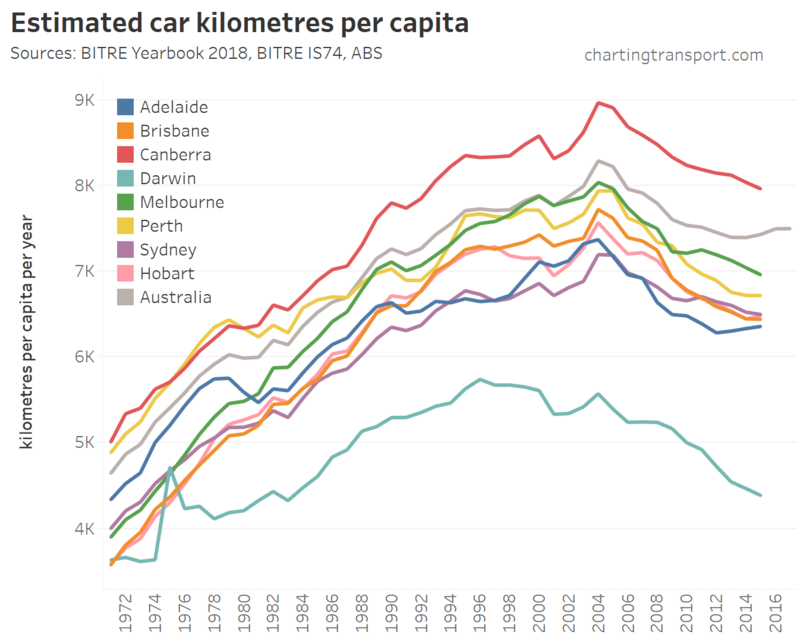 The following chart shows car emissions per capita (which essentially removes freight from the road transport figures). 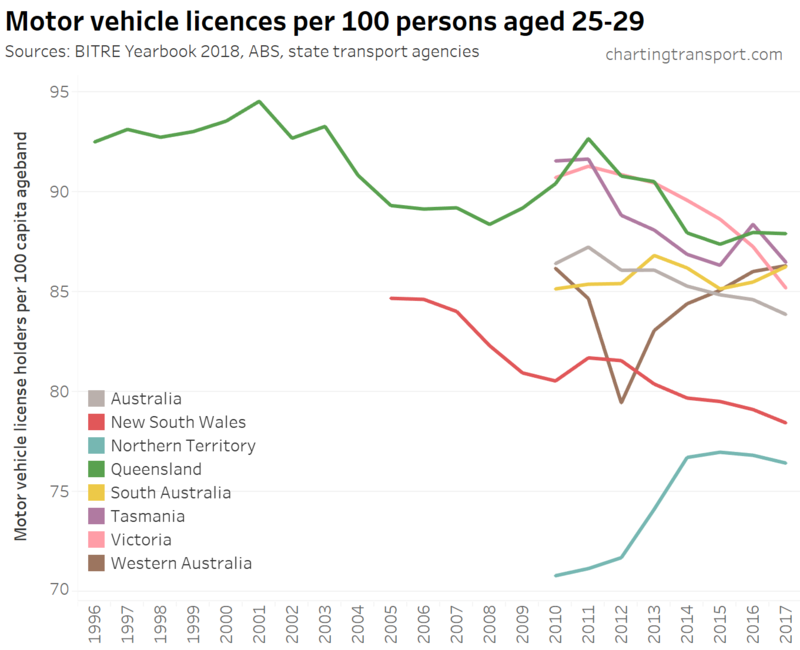 Again, all states show a decline in recent years. 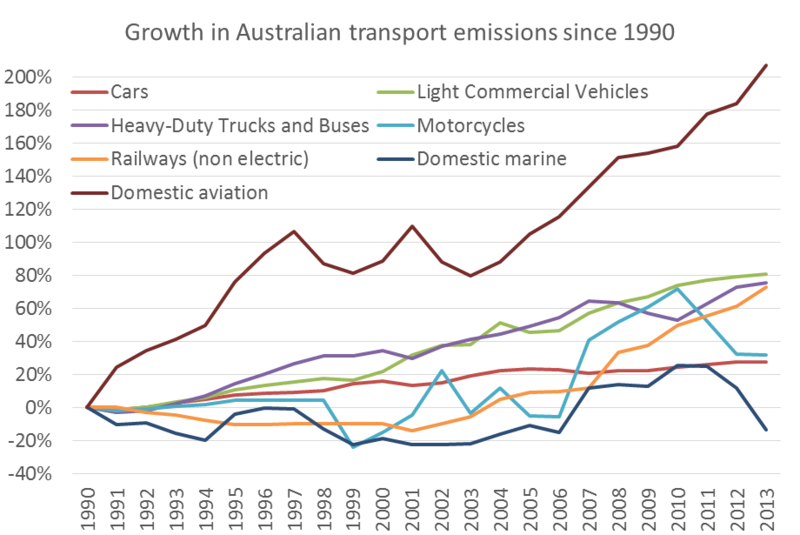 So is the drop in road transport emissions related to behaviour change and/or fuel/emissions efficiency? 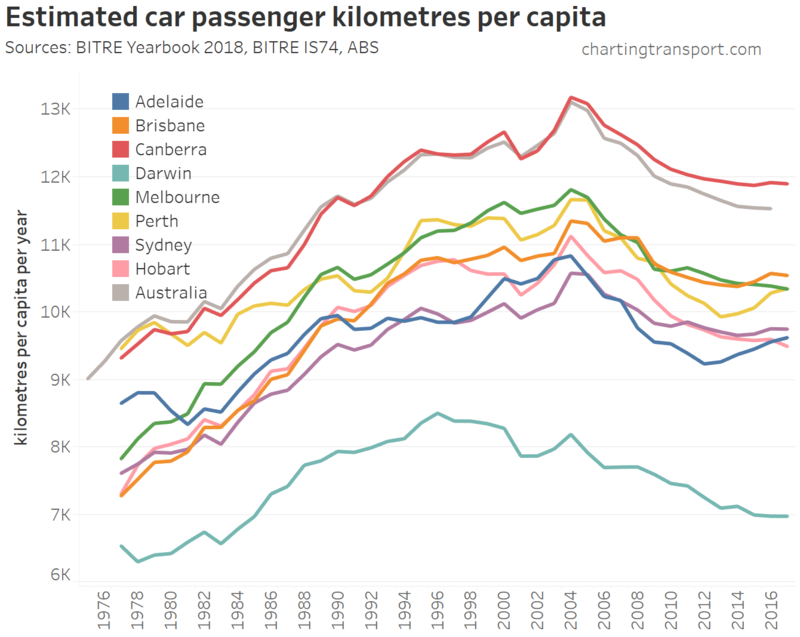 Since 2007, car emissions per capita have been declining, but car emissions per kilometre have not – suggesting the reduction in emissions would be primarily due to changes in travel behaviour, not improvements in engine technology (or at least that improvements in engine technology are being cancelled out by us buying cars that are heavier and/or that have more energy intensive features). 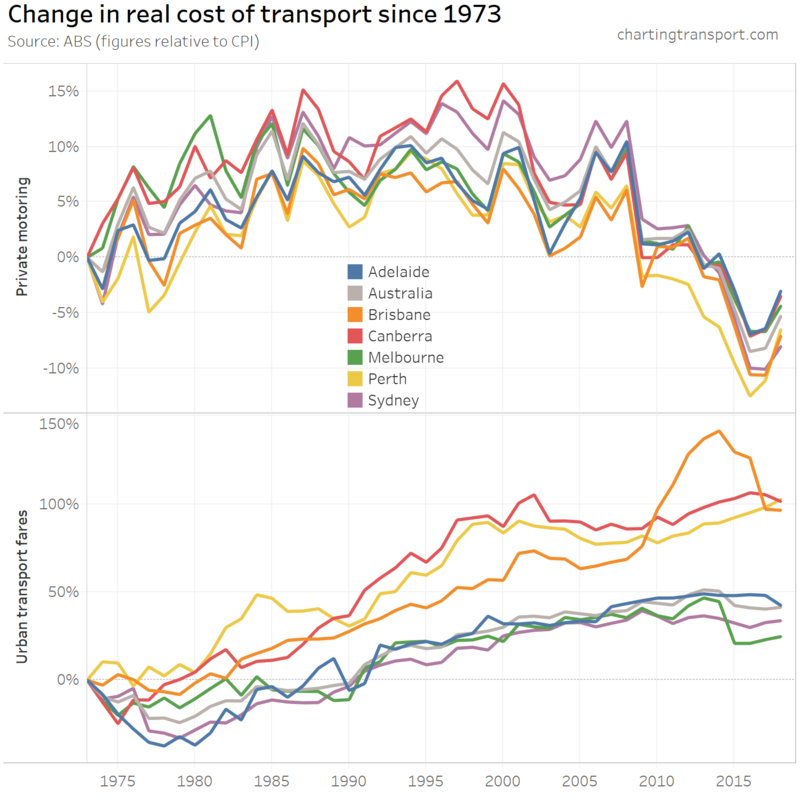 What about transport emissions in cities? 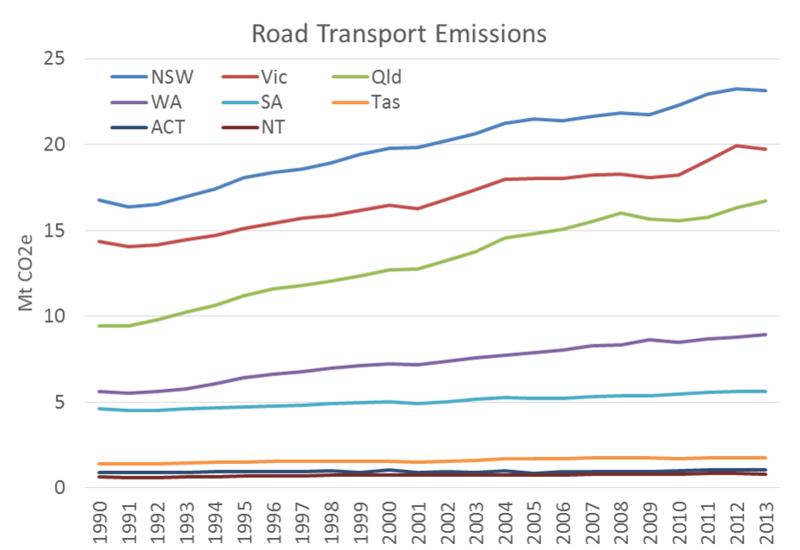 As part of the Victorian Transport Plan, the Victorian Department of Transport commissioned the Nous Group to do a wedges exercise on Victorian transport emissions. 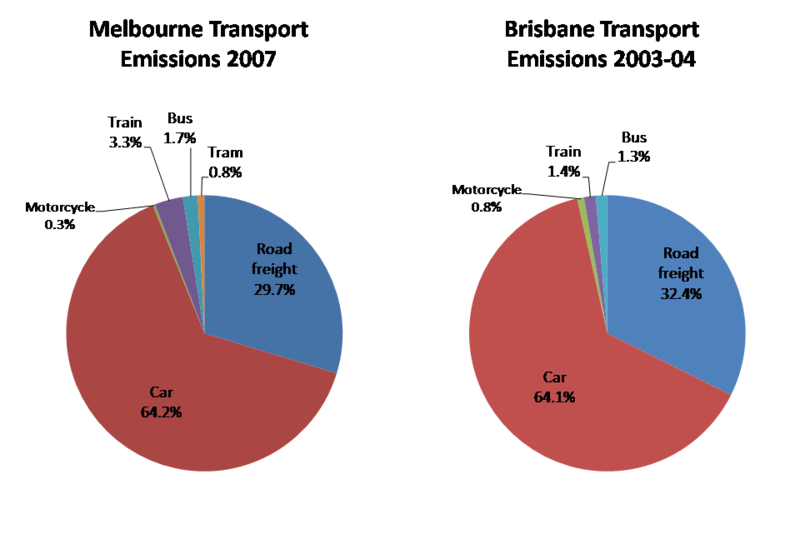 This report included estimates of Melbourne’s 2007 transport emissions (12,270 Mt). 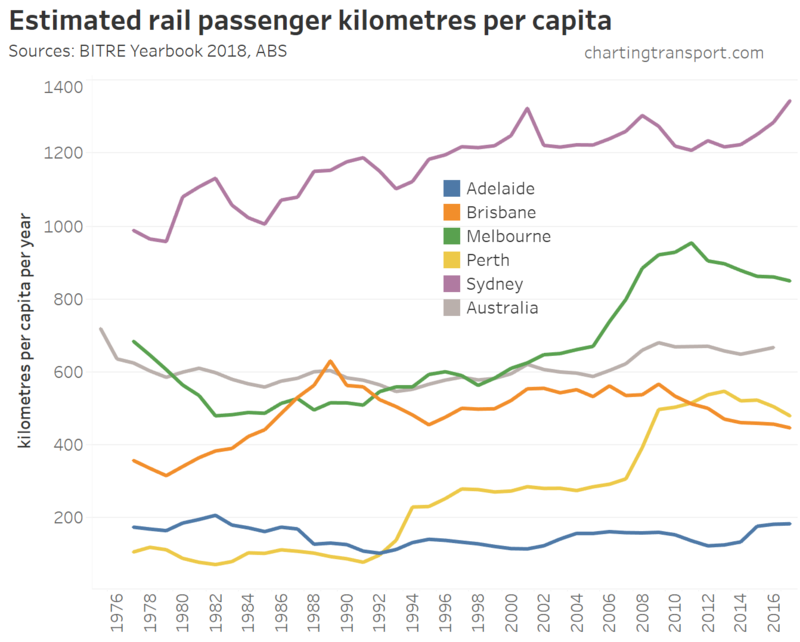 In addition, Apelbaums’s Queensland Transport Facts 2006 was for a brief time on the internet and I was lucky enough to grab a copy. 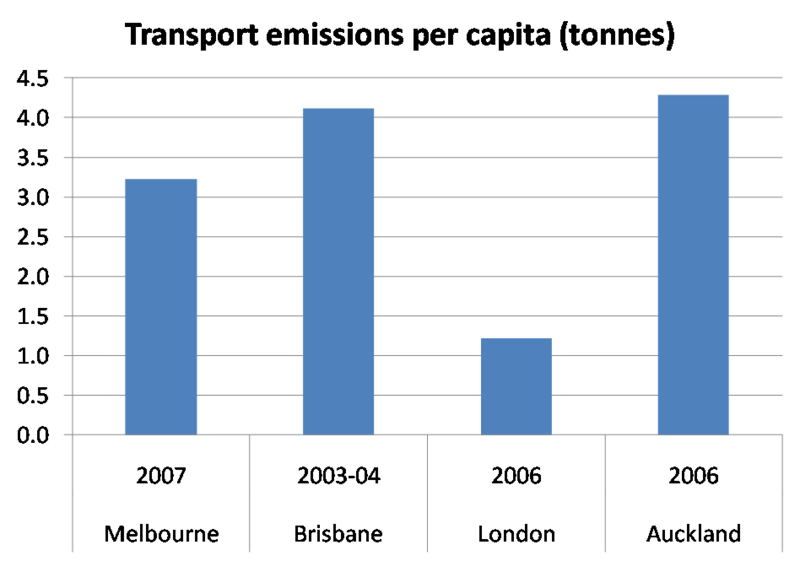 From that report, estimates of Brisbane’s 2003-04 transport emissions can be derived (7,312 Mt). 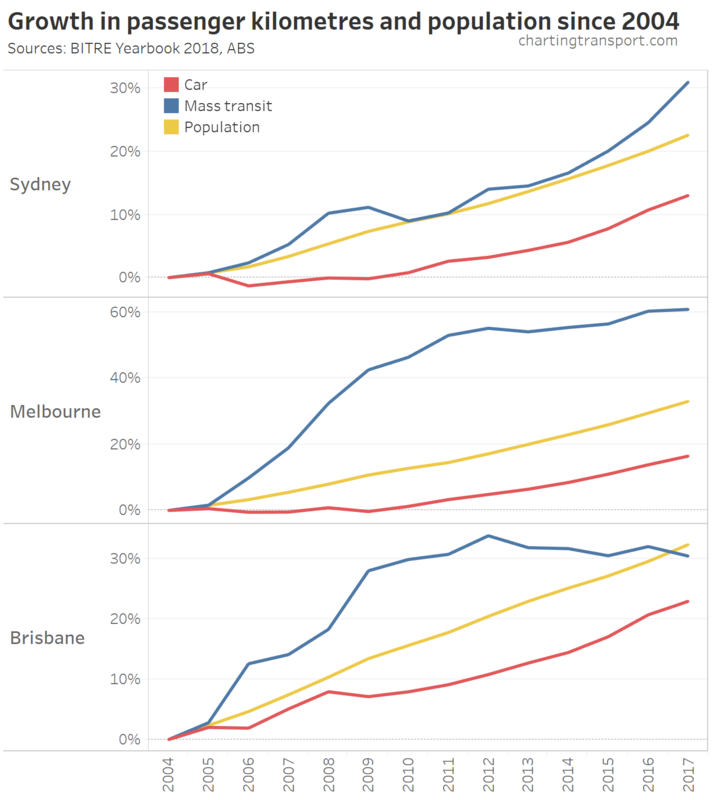 Obviously these cities’ transport systems and energy sources are very different, but it shows what is possible even for a large city like London. 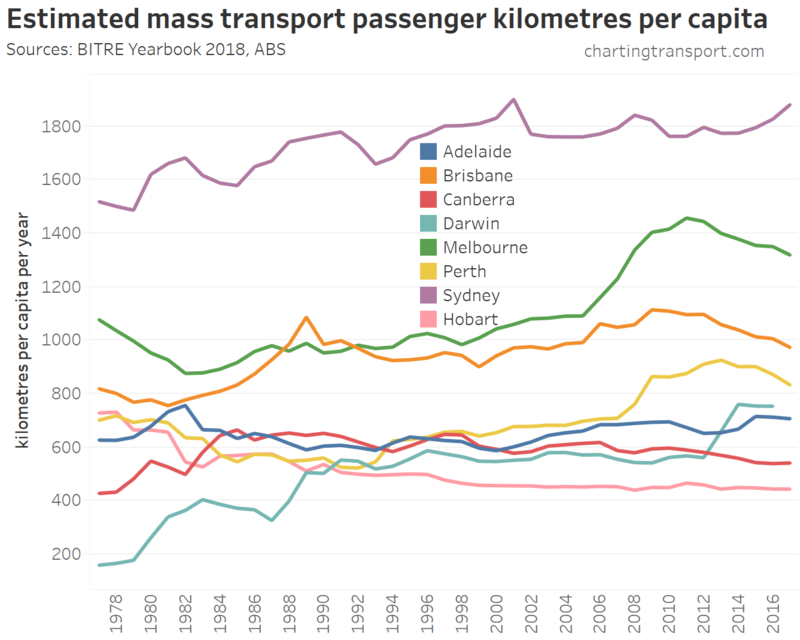 Transport emissions will closely follow transport energy use per capita, which has been the focus of a lot of research, particularly by Prof Peter Newman (eg his Garnaut Review submission). 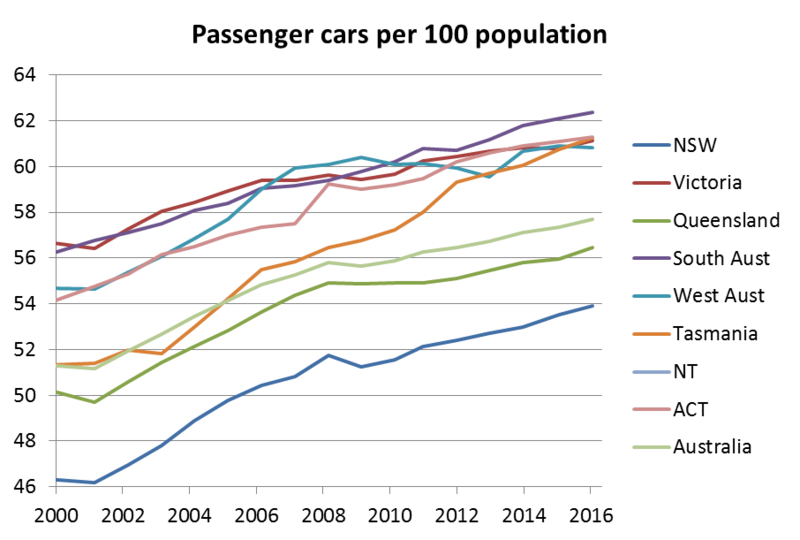 For 1995 measures of passenger transport emissions per capita for other cities, see this wikipedia chart created using UITP Millenium Cities Database for 1995. 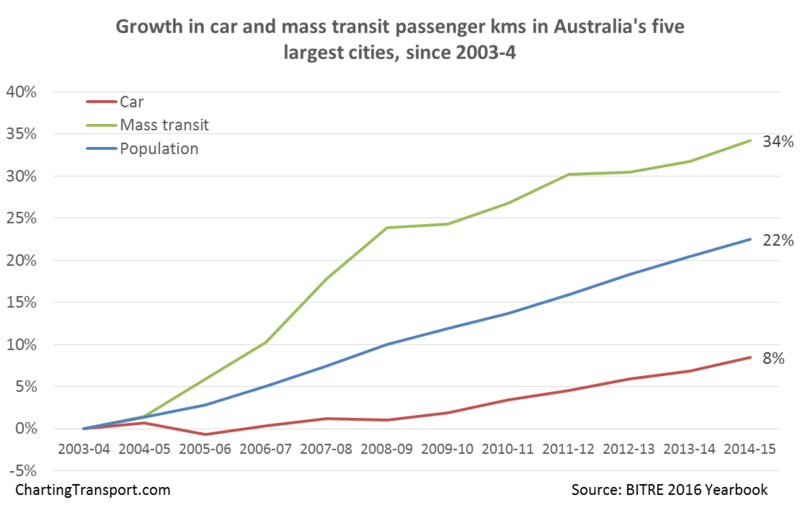 Note: these figures only include passenger transport and hence are different to the above. 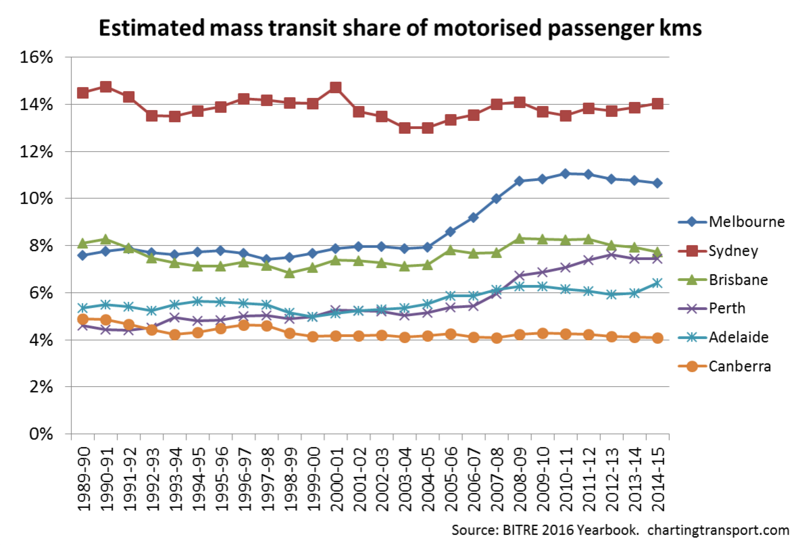 Also, here is some data for US cities from the Brookings Institute, but it excludes industry and non-highway transportation so is not comparable to the above chart. 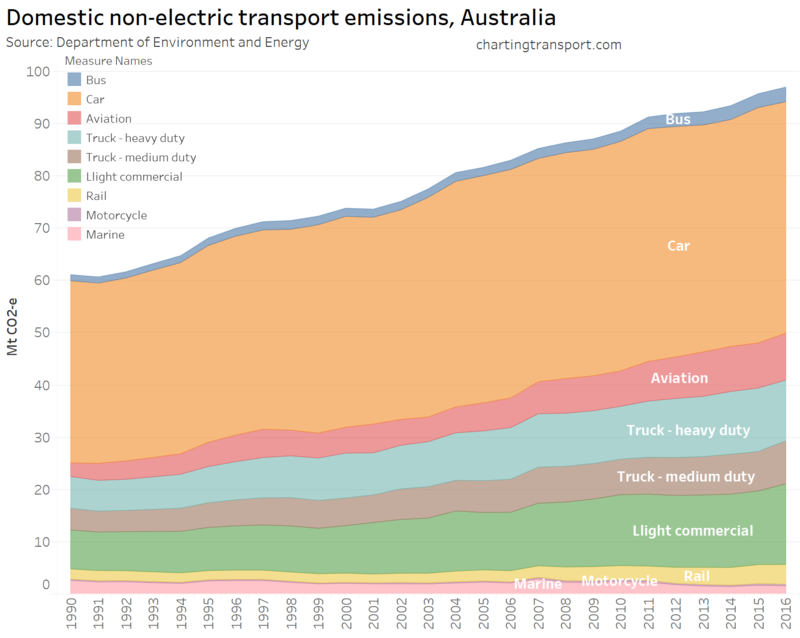 Where are transport emissions headed? We appear to be tracking fairly closely to the 2007 projections. 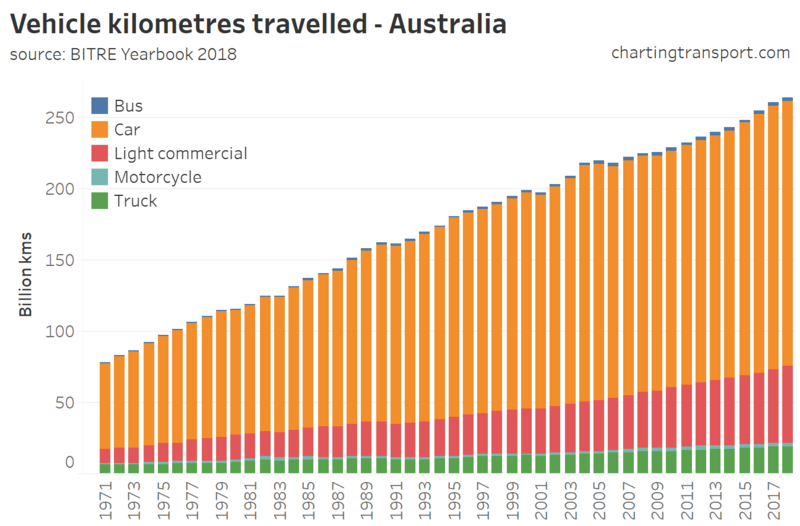 The 2010 projections anticipated a reduction in emissions per kilometre travelled, which has not eventuated, as we saw above. Note the 2015 projections do not include abatement measures – no prediction was made about the effect of abatement measures of which there are few in the transport space of which I am aware. 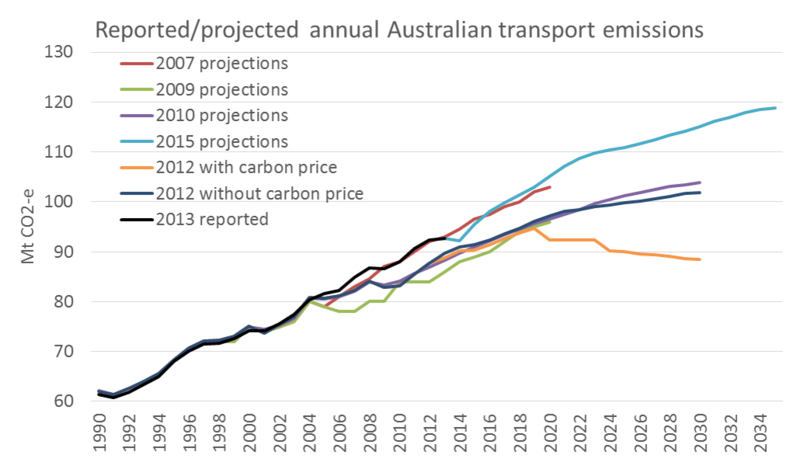 The only projection that included a decline in transport emissions was a 2012 scenario including a carbon price, which has since been abandoned by the Abbott Government. 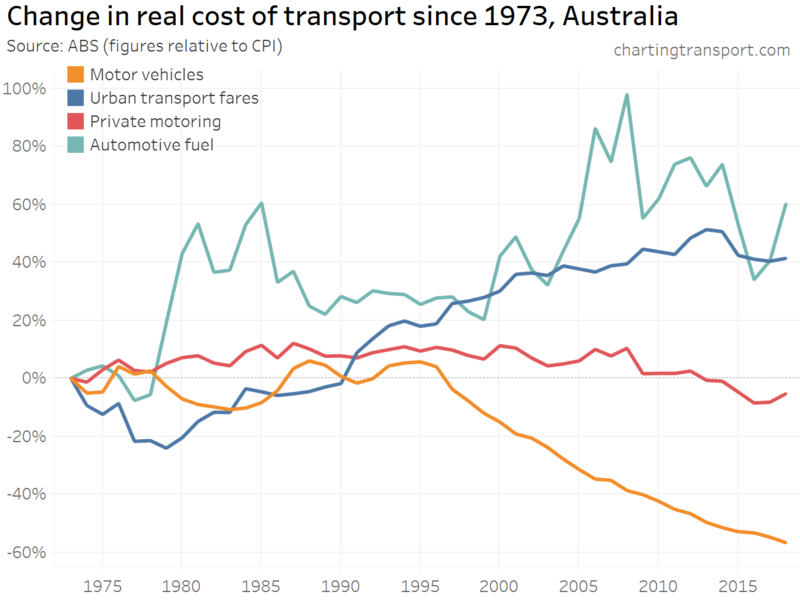 On Tuesday 20 March 2012 I gave this presentation to the Transport Economics Forum in Melbourne using material from this blog and some recently released data in BITRE’s Working Paper 127 on traffic growth in Australia. 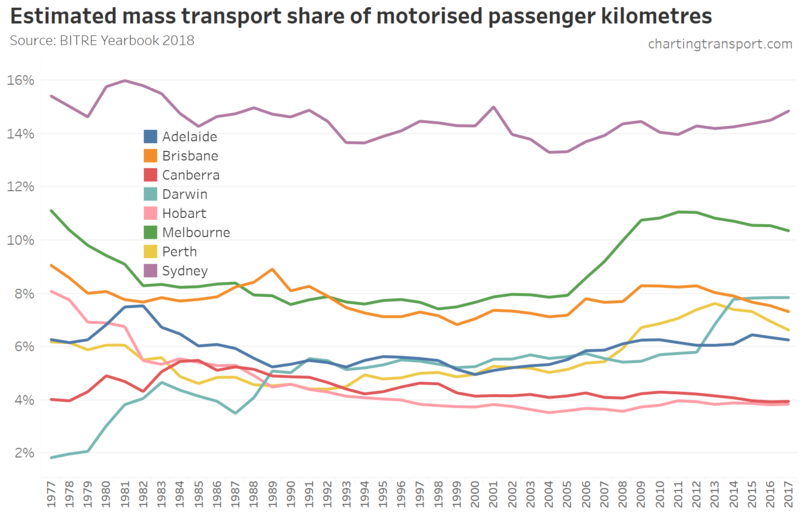 The presentation challenges some orthodox assumptions about transport trends in Australia and Melbourne. When I get time, I hope to update existing posts to include the most recent data on (the lack of ) traffic growth. 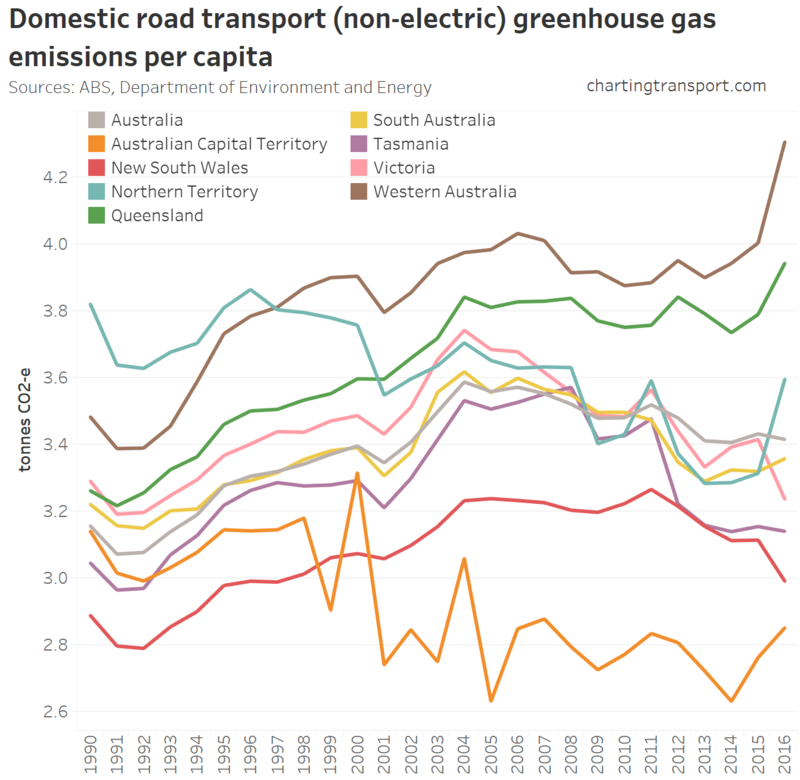 How do Australia’s transport emissions compare with the rest of the world? 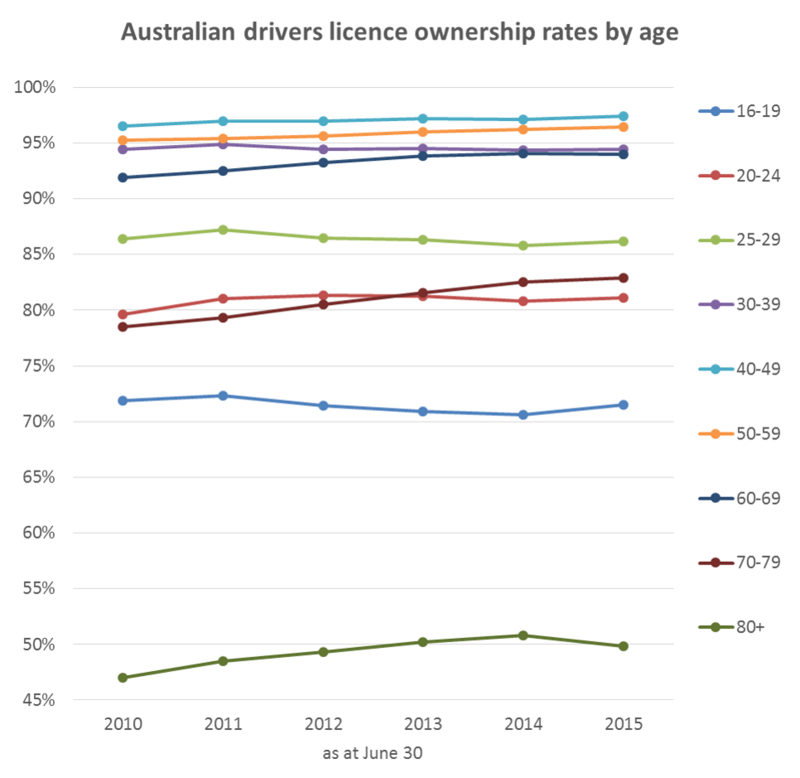 This post takes a high level look at some international data. The most extensive data source appears to be from the International Energy Association, which includes 140 “countries” but uses slightly different estimation methodology to UNFCCC data. 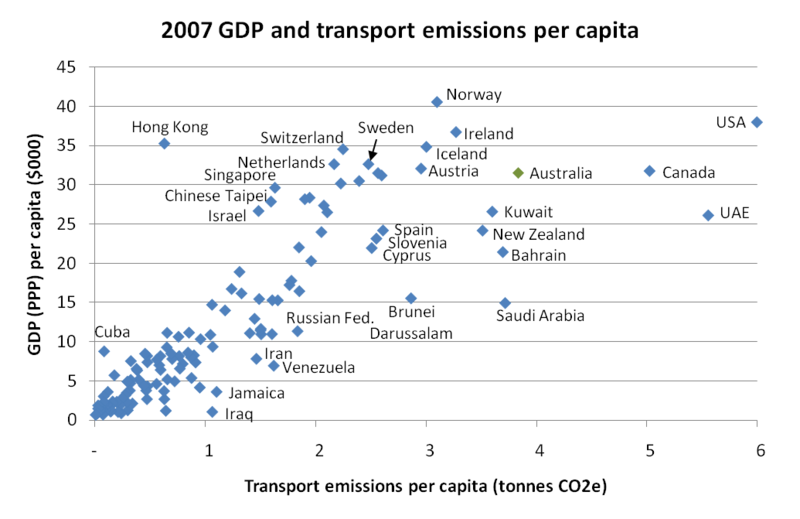 The following chart shows the countries with the highest transport emissions per capita in 2007, from IEA report CO2 Emissions from Fuel Combustion 2009. Note there is a very long tail on this chart, and my cut off point is arbitrary (Portugal and Oman aslo come in at 1.8). For the record, the Democratic Republic of Congo is at the bottom of the list with 0.009 tonnes per capita. Netherlands Antilles (which consists of two sets of tiny islands in the Caribbean) has a population of 191,000. Petroleum is a major part of the economy leading to high wealth. 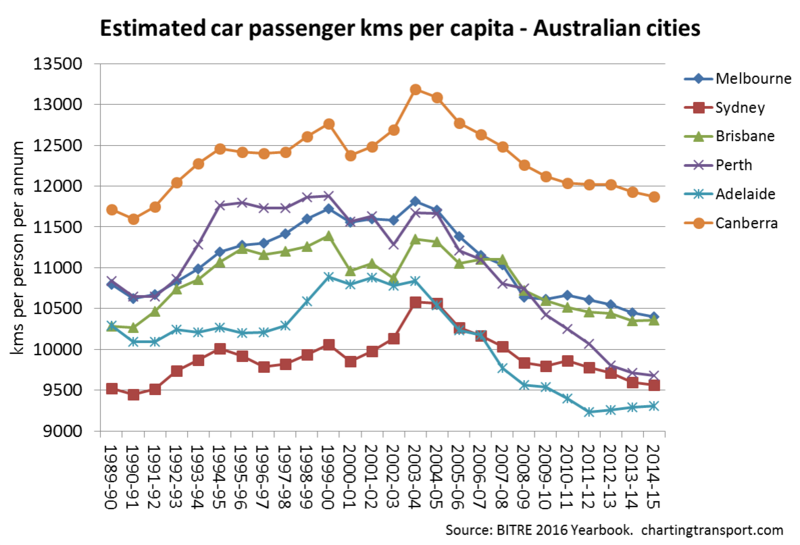 This makes Australia the fourth highest per capita transport emitter of countries with a population over 1 million. 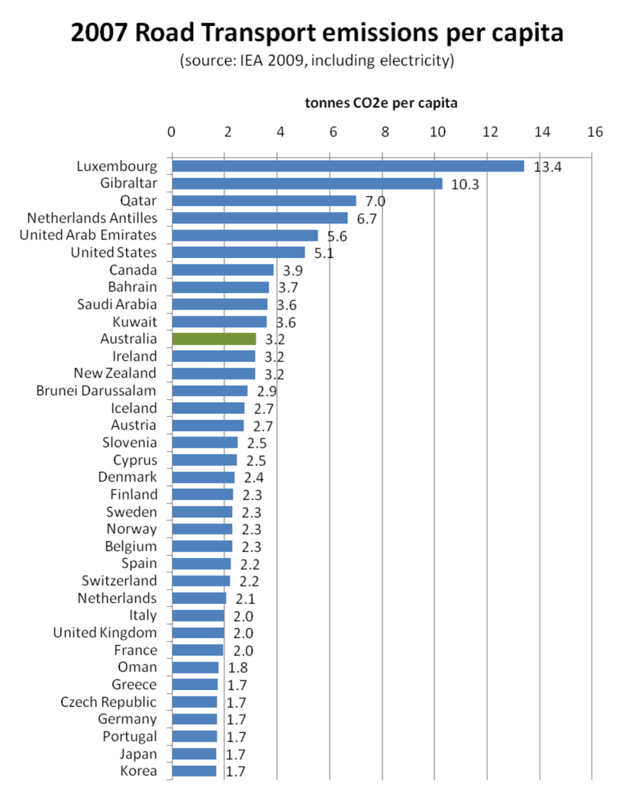 Australia is also fourth highest of the 31 OECD countries. 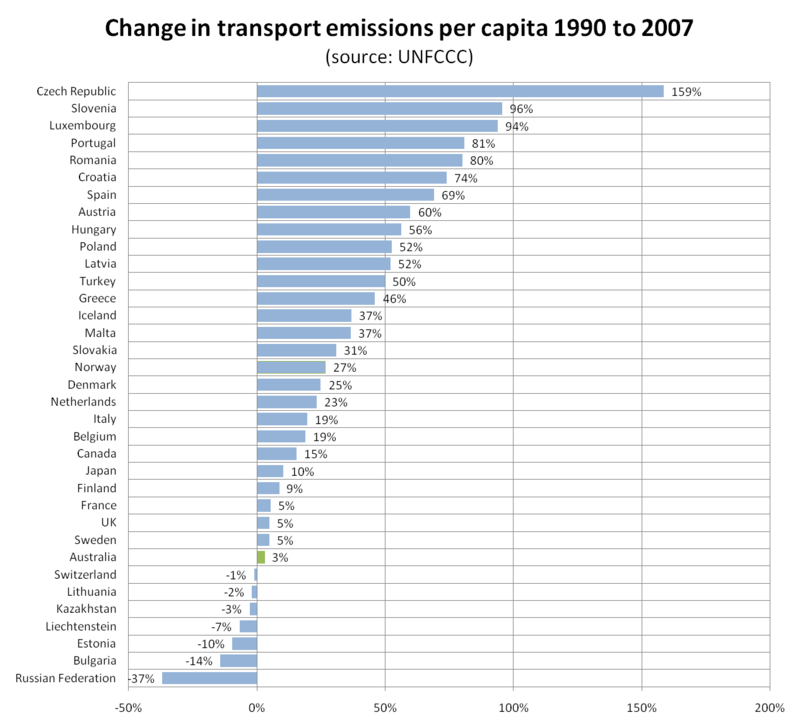 The following charts use time series data from the UNFCCC for countries where both a 1990 and 2007 figure is available. Many of the high growth countries are unexpected for me. 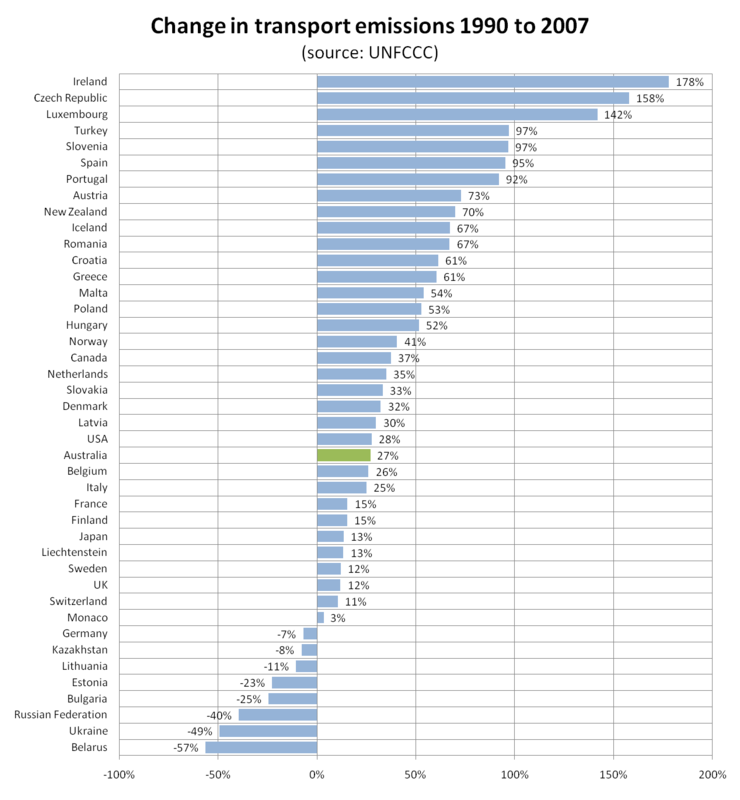 The former states of the Soviet Union have shown large reductions in emissions. 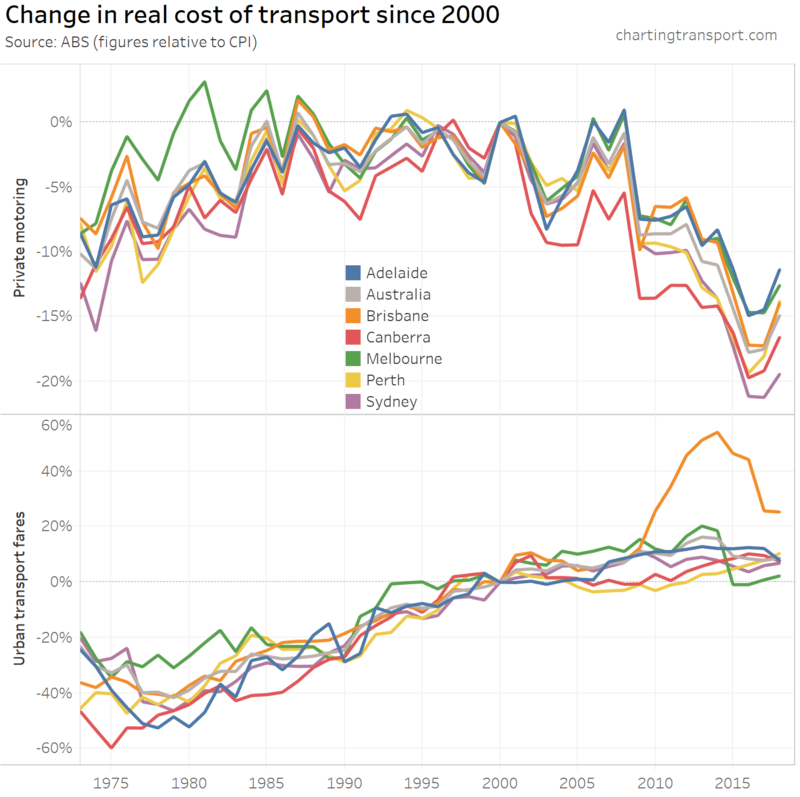 So does being richer mean having higher transport emissions? 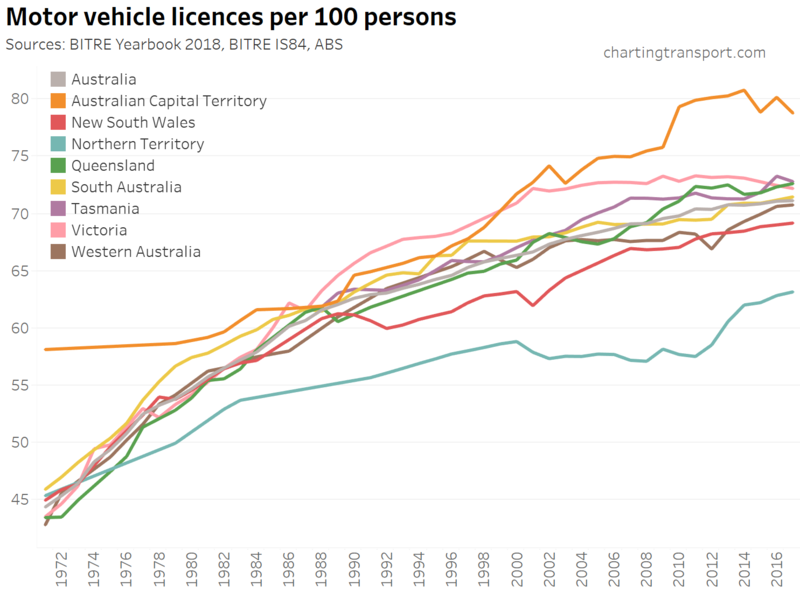 On visual inspection there appears to be a strong correlation with a few outliers (the Netherlands Antilles comes up again!). Many countries with higher emissions to wealth ratios have large oil industries (and often high petrol price subsidies). Eg Saudi Arabia, UAE, Brunei, Venezuela, Iraq, Bahrain, Iran. Most countries with high wealth and lower emissions are small in size (Hong Kong being near the extremes for size and wealth). Cuba, which lost its supply of oil from the Soviet support in 1989, is known for a dramatic transformation to reduce oil dependence. 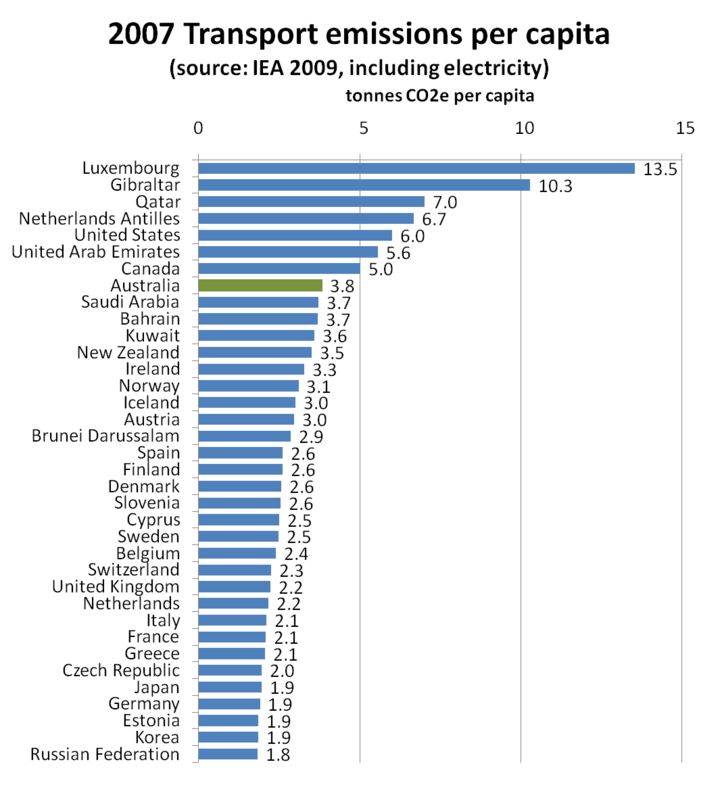 Cuba is showing somewhat modest wealth (slightly above the global median) with low transport emissions per capita. 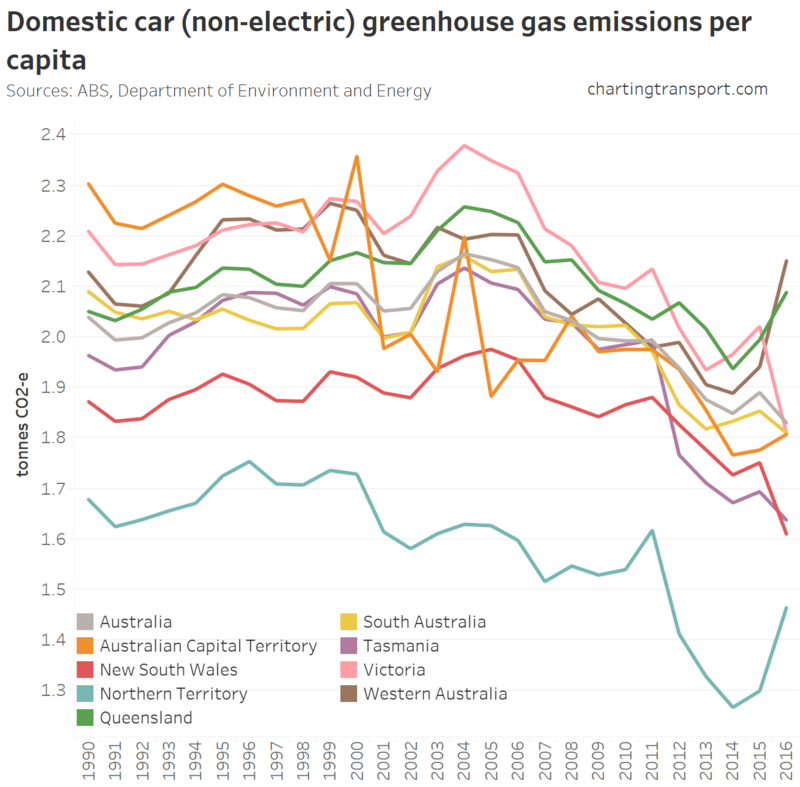 The rich English-speaking countries of USA, Canada, New Zealand and Australia show high emissions per capita compared with other similarly wealthy countries. They could use the excuse of a large land mass, but this is less applicable to New Zealand. 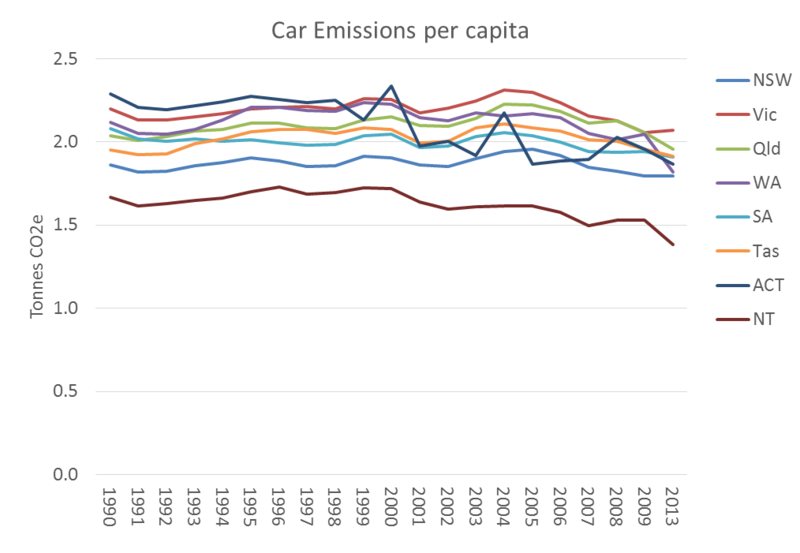 So is the high emissions a product of geographic size (note the Russian Federation shows relatively high transport emissions relative to wealth), and/or is it a product of unsustainable transport patterns? 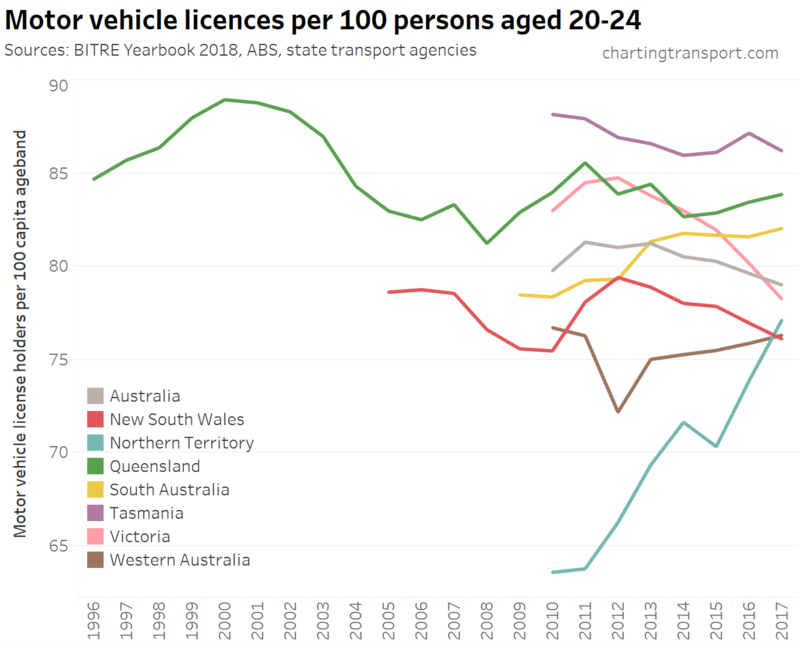 (those four countries being very car dependent for urban transport). Probably both I suspect. 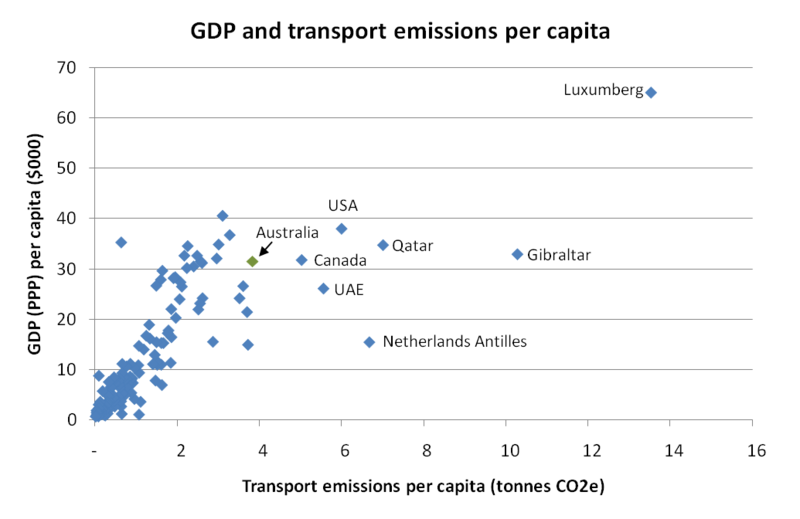 Does this show countries that might be leaders at decoupling wealth from transport emissions? Of the “non-tiny” states, Israel, Netherlands, Chinese Taipei, Switzerland and Sweden seem to be doing fairly well. 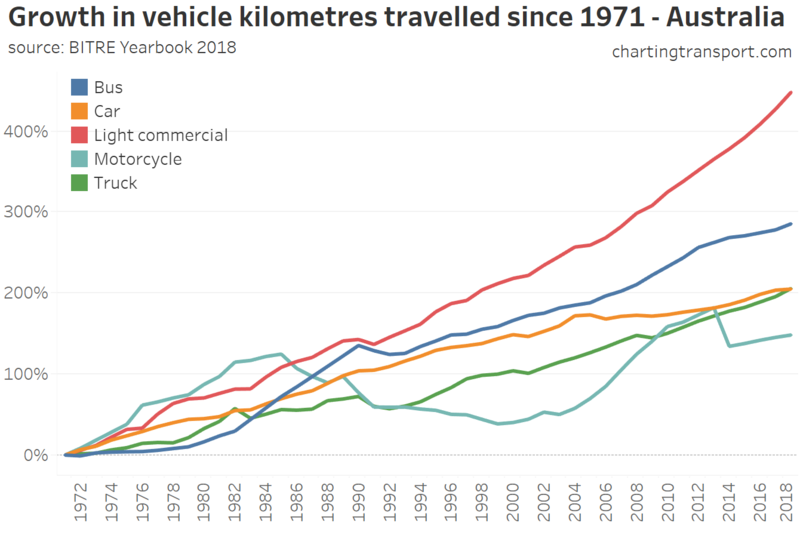 The Netherlands is world-renowned for having high rates of cycling and I know the Netherlands, Switzerland, and Sweden have excellent public transport networks. I don’t know much about transport in Israel and Chinese Taipei. 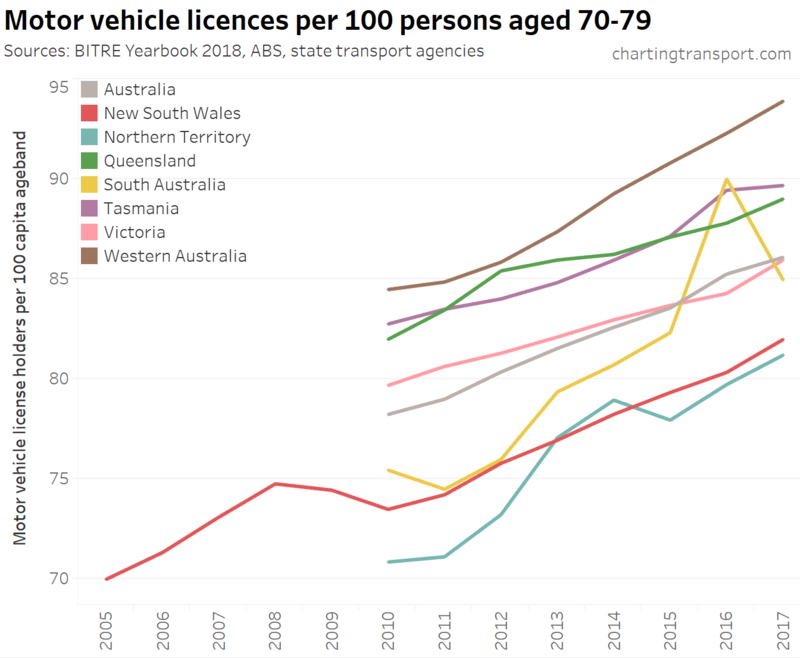 Again a lot of oil states appear high in this list (Australia comes in at 121 g/$). 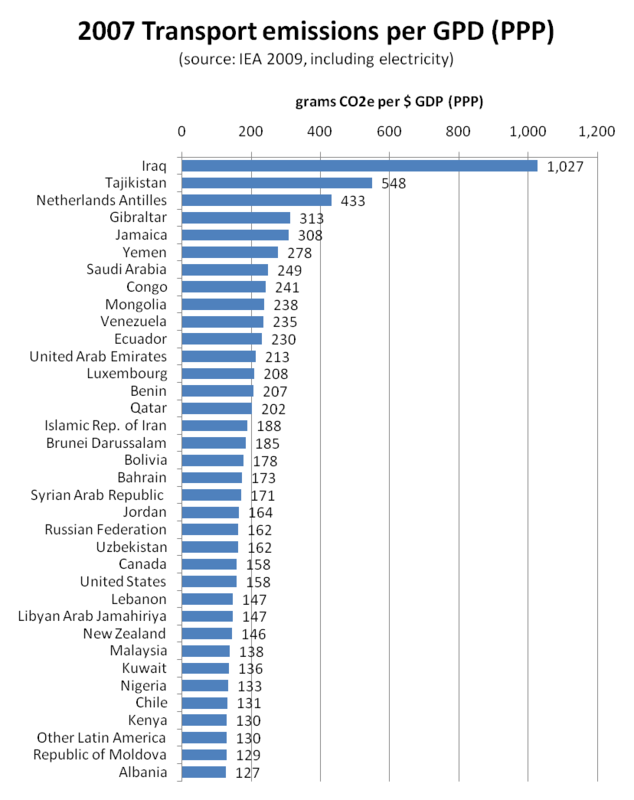 Interestingly, the Congo appears high in the list – perhaps because it has such a small GDP. 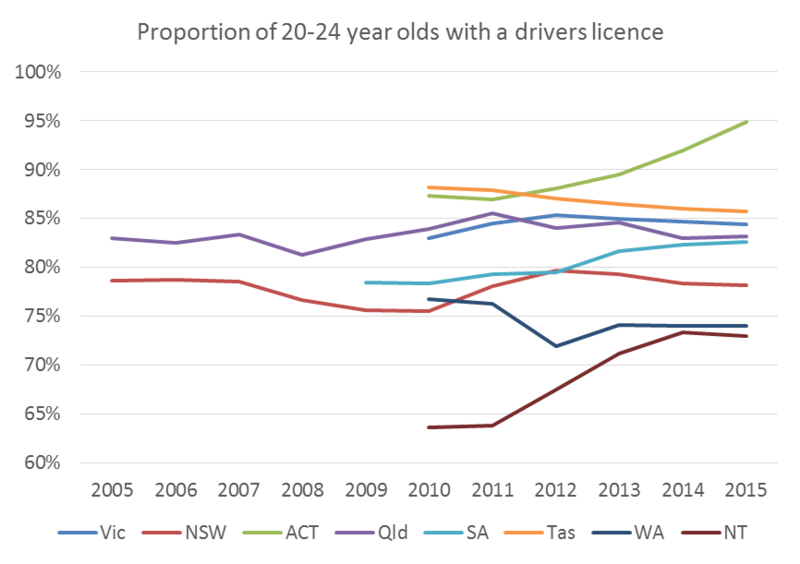 But I am not sure that too many more conclusions can be drawn from this data. Many of the top countries in this list are major international aviation hubs, eg Qatar, UAE, Singapore, Hong Kong. 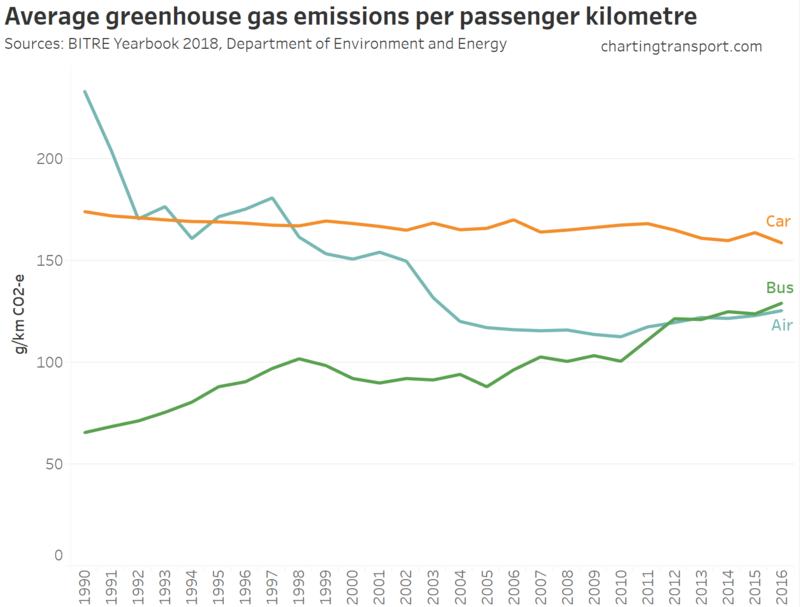 Assigning these emissions to those countries is probably unfair if a large proportion of the passengers are travelling through. But it does highlight their dependence on the very carbon intensive industry of international aviation. 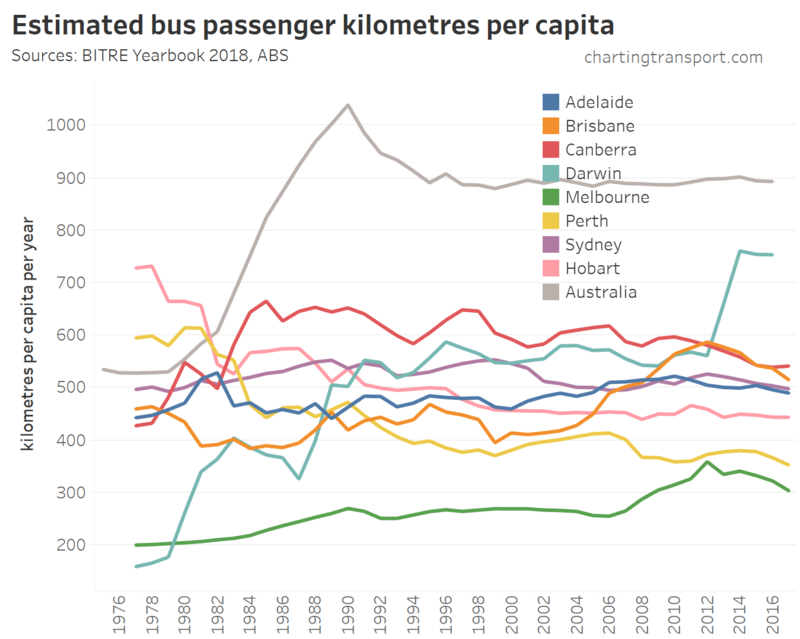 Other countries are island states where water-based passenger transport is less competitive – eg Iceland, Netherlands Antilles, Cyprus, Ireland, New Zealand, UK, Malta. Others appear to simply be wealthy countries – eg Luxemburg, Bahrain, Kuwait, Netherlands. Emissions from international marine bunkers make up around 9% of global transport emissions, according to the data. You are currently browsing the archives for the Greenhouse Gas Emissions category.